Have you ever made a homemade sourdough bread? It is not as difficult as you might think. In fact, if you have baked regular yeast bread before, this recipe will be a cinch. 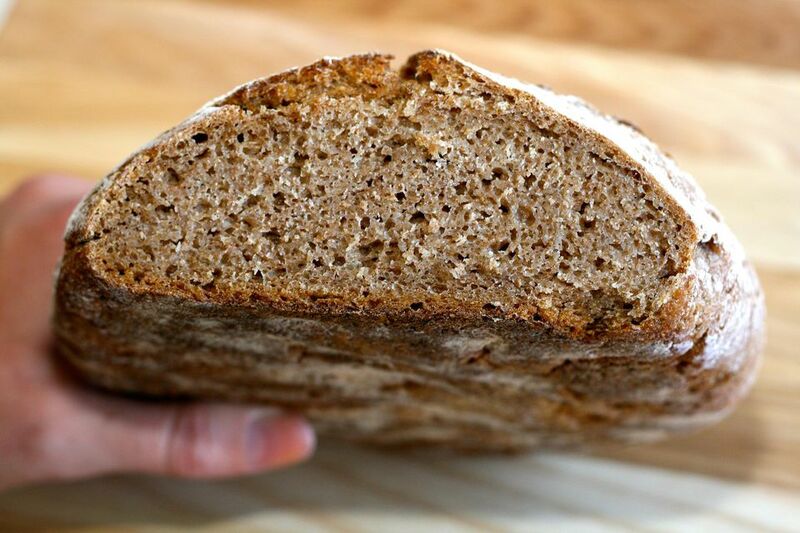 This whole wheat sourdough bread is an old-fashioned bread recipe made with over 4 cups of wheat flour and your favorite sourdough starter. The recipe makes two heavy, solid loaves that are moist and delicious on the inside and surrounded by a hearty, thick crust. The bread is started at night and allowed to turn to sponge while you sleep. After waking, the remaining ingredients are added and the bread is baked. This recipe for whole wheat sourdough bread makes 2 loaves of bread - one for eating and the other for freezing for later or for sharing with a friend or family member (homemade breads make the best gifts). On the night before you plan on baking, mix together the whole wheat flour, warm water, and a cup of your favorite sourdough starter in a large bowl. Cover bowl with a clean kitchen towel or plastic wrap and let set overnight on the counter. The next day, stir down sponge. Mix in baking soda, salt, honey, and vegetable oil. Mix in the bread flour. The dough will be sticky. Knead the dough for about 5 minutes. To do this, I grease my hands lightly with vegetable oil to prevent the dough from sticking to my hands and I knead the dough inside of the large bowl. Grease two 9 x 5-inch loaf pans. Divide dough in half and place in loaf pans. Cover and let loaves rise for 2 hours or until the dough has risen a little over the edge of the pan. Bake loaves at 425 degrees F for 20 minutes. Reduce heat to 375 degrees F and bake for another 30 minutes or until bread sounds hollow when tapped on. Turn loaves out and let cool. Bread can be cooled completely, bagged, and frozen for up to 3 months.